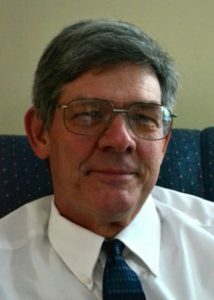 Description: Ross Doerr was born in 1952, and grew up in Detroit and south Florida. He earned a law degree in 1988, passed the bar exam in New Hampshire, and frequently represents clients with disabilities. DOERR: My parents kept saying, “If you go blind, you’ve gotta know what to do when you’re blind.” And I started hearing that at age six and it went all the way up through high school. And that mantra really began to tell the tale in a lot of different ways. Because by the time I was in high school, I had paid very close attention to what everybody was telling me. I was looking at what other blind people were doing. What other blind people were doing was one of two things–nothing, or they were caning chairs. NARR: Ross Doerr is an attorney who began to lose his sight as a child. He remembers the day his visual impairment came to the attention of his parents and his first grade teacher. NARR: Doerr’s sight had been damaged by a blend of macular degeneration and retinitus pigmentosa. As a result he was assigned to a special school where he was lumped in with a variety of disabilities, leaving behind his friends. NARR: And transportation to the school involved a long trek across the city of Detroit. NARR: While he retained some of his sight as a young man, Doerr did a variety of construction jobs in south Florida. DOERR: I started out as a block mason’s laborer. I was hustling concrete blocks from the truck that delivered the palettes of concreted blocks over to where the block masons needed them, and if I wasn’t doing that, I was hoeing and hauling buckets of mud, so that they could put the bricks in place. Let me tell you, you get in good physical condition really fast, and you get one heck of a tan. NARR: One of the things he noticed was the demand for electricians. He worked as an electrician’s apprentice, including working on a job at an expensive mansion in south Florida, with a very complicated wiring structure. DOERR: It was huge; it was complicated, and I was really proud of that. After that job was done, it got lit up, it passed inspection, everything was fine. I went to the boss and I said I’d like two things. I’d like a raise, and I’d like you to sign off so that I can take the journeyman’s test. He said, “You’re not getting a raise, and I’m not signing off for you to take the journeyman’s test, you’re half blind. What if you were a journeyman and you crossed wires and burned a house down?” Well, that was the dead end of that. I had just hit a brick wall. There was no ADA then. NARR: But as a young teen, he remembers visiting an attorney’s office with his grandmother. DOERR: We went to see this lawyer, and I went in the room with her, and the lawyer was blind. Well, he hadn’t been blind when he started practicing law, he lost his eyesight over the course of many years, and I don’t know exactly what the cause was, but it was immaterial. But here was a man who was smart, and my grandmother, who could see, who could drive, who could walk and talk, was paying him money. Now, if he could do it, how come I can’t do it? I was thinking college, some sort of profession. Everybody else was thinking caning chairs, learn Braille. NARR: But getting into law school as a visually impaired student was not an easy task. NARR: Doerr graduated from the University of Santa Clara Law School in California in 1988. Throughout the 1980’s and 1990’s he says he was aware of the disability rights movement, and the debate over the ADA, but not heavily involved in it. DOERR: I had heard that things were going on regarding it, but for the most part, nothing was happening. People were talking, people were going to Washington and marching. People were going to the statehouse and the legislature, talking to legislators and stuff. I didn’t have enough money half the time to put decent food in the refrigerator and pay one room efficiency rent. The thought of going to Washington or going to the statehouse–I mean that’s like saying, “I’ll just get on a plane and fly to London.” The money isn’t there. NARR: Doerr, who works as an attorney representing individuals in disability and voting rights cases, says the ADA has made a difference, but that difference is limited. DOERR: So when you say, “Was I part of the movement?” No I was on my own. I knew what the issues were; I knew what the problems were. The one thing I didn’t need was somebody saying, “You need to accept your disability.” I wasn’t the one who needed to accept it. It was the people who were refusing to hire me who needed to accept it. I knew exactly what my disability was. If there was a movement, I certainly was not part of it. I was too busy trying to solve my problem on my own. NARR: The road ahead, according to Doerr, can be summed up in one word. DOERR: Education. Education. Bar none, education. Where the Individuals with Disabilities Education Act, IDEA ends is for all practical purposes, public school. When you’re out of public school, the obligation for special education pretty much grinds to an end, and then it’s special services through university system. Everybody says you need to get a good job and you need to get a good education, and you need to be able to get a good job, and it all ends when it comes to getting a job. Everybody is willing to help you as long as you don’t work in their office. The education has to be turned up about a hundred degrees. NARR: I’m Keith Ludden. Our series on the twenty fifth anniversary of the Americans with Disabilities Act is funded in part by the Maine Humanities Council, in partnership with the Maine Arts Commission, Oral History and Folklife Research, Alpha One Independent Living Center, WMPG, and the Disability Rights Center of Maine.